The lab is located on the upper ground floor, Room 2005, Long and Kimmy Nguyen Engineering Building, Fairfax Campus, George Mason University. When you come in the front doors, we're the first thing you see on your right, large double doors. The rest of the Computer Science department is located on the 4th and 5th floors of the Long and Kimmy Nguyen Engineering Building. Please make sure to call/email in advance to ensure someone is there to meet you! A map of GMU Fairfax campus is shown below. 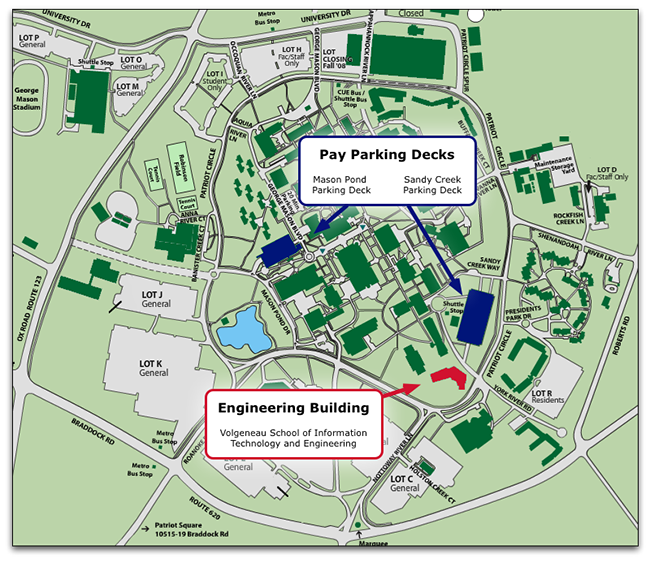 Note the Long and Kimmy Nguyen Engineering Building and the two available parking decks. Do not park anywhere except for the two decks; a campus permit is required to park anywhere else on campus.